Thanks to your support we sold out 10 runs of this kit! If you missed on on this kit, but want to order one, please send me an email and I’ll start a new run if there is enough demand. The 41000 series is part of the Defense Freight Railway Interchange Fleet. It is a 100T flat car used to transport heavy military vehicles. It can support one M1 Abrams Tank, or two Bradley fighting vehicles, or other combinations of lighter vehicles. AMF Technotransport in Montreal built 256 over the period 1994-1996. They are still in service today. The kit uses photo etched parts with a laser cut plywood core. The brake details are 3D printed IAW prototype drawings. The kit includes a good representation of the under body detail, but is still easy to assemble with CAA. No soldering is required, but you are welcome to solder if you wish. 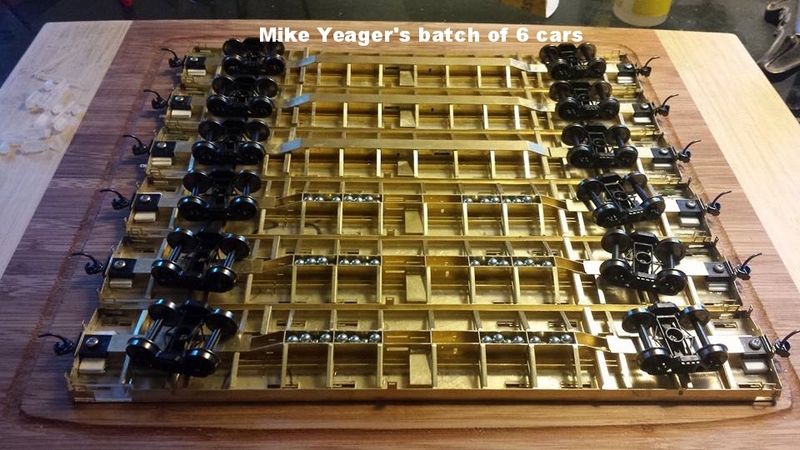 The parts have engineered slots and tabs that self-jig. The side frames use a bending design that requires no tools to form. You just use your hands and a flat hard surface to bend the parts. The kit also includes decals. As a bonus the decals can also be used to letter the 40000 and 48000 series. Athearn 100T trucks and a Kadee coupler must be provided by the user. The kits also include photoetched military style tie down chains, shackles and rings. The chains stay with the car when it is empty, or can be used to load HO scale armored vehicles and trucks. The chains will also be available separately, see this link. Thanks to Chris Mears who did the 3D brake detail drawings, Dave Olsen for dozens of photos, and George Gounley for the prototype drawings. Photo etched brass, Laser cut acrylic and cast metal parts based on 3D printed masters. Here is a parts diagram to help identify the parts in the kit. Note that there are lots of extra parts in case you lose, or damage a part.